Is Fish Oil Dangerous With Antidepressants? Fish oil contains two brain chemicals that are commonly found in individuals suffering from depression: EPA and DHA. Although some studies have linked fish oil supplements with reduced symptoms of depression, the long-term effect of these chemicals on depression and other mood disorders remains largely unknown. 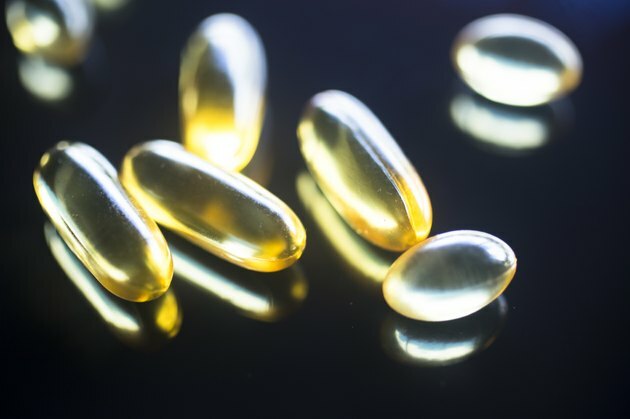 Adding a fish oil supplement to your diet shouldn't pose any dangers or health risks, and may actually improve the effectiveness of your antidepressant medication. According to the Mayo Clinic, fish oil is a rich source of omega-3 fatty acids, an essential nutrient for maintaining proper brain function. Fish oil supplements containing 100 to 300 milligrams of EPA and DHA may offer benefits in relieving depression by boosting your natural levels of these chemicals in the brain. Fish oils derived from mackerel, lake trout, sardines, albacore tuna, salmon and herring are considered particularly high in DHA and EPA. Individuals who stop taking their antidepressant medications because they are taking fish oil may be at risk for reoccurring depression symptoms. According to the "Journal of Psychiatry and Neuroscience," no studies have been performed on the ability of fish oils to prevent reoccurring depression, meaning that individuals who receive immediate benefits may have their depression symptoms return over time. Mood disorders have many potential causes, and may require a variety of approaches and medications in order to effectively reduce depression symptoms. Despite its benefits in mood disorders such as depression, fish oil should not be used as a replacement for antidepression medications. According to studies cited by the Medical Daily website, including one at Washington University in St. Louis published in "The Journal of the American Medical Association" in 2009, supplements that contain 1.3 to 1.4 times more EPA than DHA have been considered to have the largest impact on depression, although the specific reason for this is unknown. In addition to fish oil supplements and antidepressant medications, your doctor may recommend exercise therapy, counseling and other depression therapies. Adding fish oil supplements to your diet shouldn't pose any risks to your current antidepressant treatments. However, it may cause your doctor to prescribe adjustments to your current dosage. Talk to your doctor before adding fish oil supplements to your diet to reduce your risk of interfering with any existing medications or therapies.